I feel like I have been in a rut with my bootcamp plans lately. I’m sure you can relate to the feeling where you feel like you are just doing the same thing over and over. Realise that your bootcamp rocks. The fact that you are feeling this way means that you care about the service you are giving your clients. And I bet that means you serve them up some awesome workouts every week already. Realise that what is old and boring to you, isn’t necessarily so for your clients. Get some inspiration. I went to an old favourite of mine, ZombieFit, but you can come here to this site as often as you like. Or you can check out some other ones. Email me. If you are feeling really down about it, just shoot me an email and I will tell you how awesome you are. Now on to today’s workout. A group tag game of your choice. Split clients into two even groups. Line up one team of clients side by side in plank shoulder to shoulder. Line up the other team, also in plank but facing the first team. The end client hops up and runs to the other end and then gets down in plank. Once down on the ground they yell “Go!”. Then the next person gets up and runs over. Proceed for 90 seconds in one direction, ensuring that clients stay shoulder to shoulder. Then return for 90 seconds in the other direction, this time doing a straight arm plank. EMOM means every minute on the minute. At the start of the every minute, clients must perform push ups, nose to knees and squats. After completing the required number of reps they get to rest for the rest of the minute. Failure to complete a round inside the time limit means that the client will finish the repetitions for that round, then do 2 burpees, then rest for the rest of the minute and then join back in the following round. Total time = 20 minutes. Do not stop between 5 minute increments. Gather your clients in a circle and stretch. Talk to your clients about why they should grab their bathroom scales and throw them in the bin. Constant weighing is neurotic and unhealthy. Get some more workouts like this one up in your inbox! Join our free email list. Get more awesome ideas just like it! When you join over 11,000 trainers and sign up to our email updates, we'll send you a new workout or idea each week. 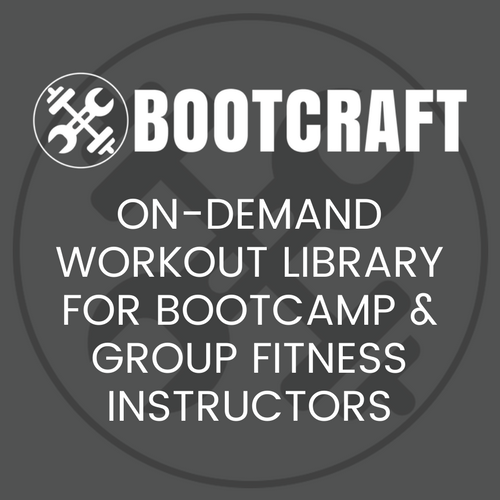 Plus, for the first 3 weeks you'll get our course 21 Days of Bootcamp Ideas for free. Just our way of saying thanks for trusting us with your email and time.